With all the demands, mom bloggers may find it difficult to work on their blogs. They have to cook meals, do laundry, shuttle kids to school, and find time to work? 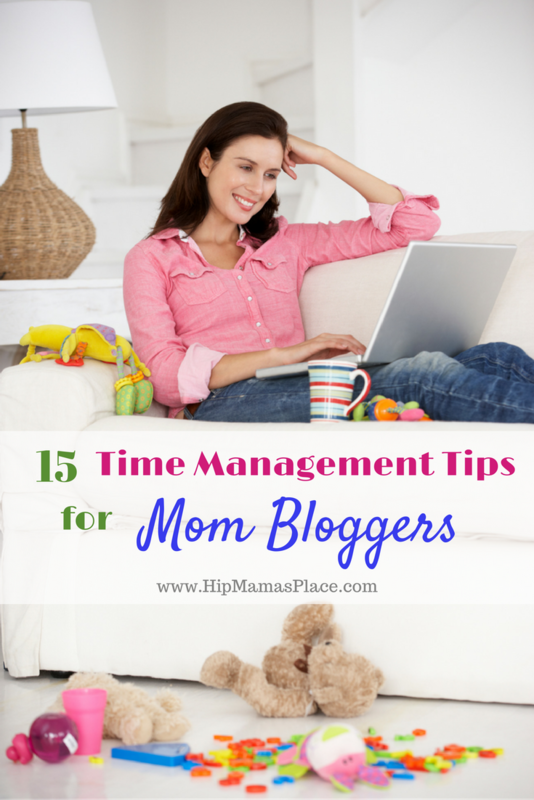 Below are 15 ways mom bloggers can manage their time wisely to get more done each day! Wake up early. The wee hours of the morning are quiet – perfect for getting some blogging done! If nothing else, you can use this time for less intensive tasks, like checking your email or scheduling social media updates. Limit your distractions. When you sit down to work, your focus must be completely on the task at hand. Silence your cell phone, turn off the TV, close out of all social media. Focusing will let you be more productive, even if you only have a couple hours a day to work on your blog. Complete work in batches. Batching is one of the best time management tips I have for mom bloggers. This consists of working on a single activity before moving onto something else. For example, make a list of 3-4 blog posts you want to publish. Write all of them without moving on to anything else. Then, edit all of them. Next, create the graphics for all of them. Finally, upload and schedule all of them. Hire a mother’s helper or a virtual assistant. While many mom bloggers cannot justify the costs of daycare or preschool, having someone to come into your home a few hours a week or to help you with outreach or social media promotions for your blog will allow you to have more time to get more done. Create a schedule for blogging. To have a successful blog, you must treat it as a business. Ensure that you put 1-2 hours of blogging work into your daily schedule. This can come in the mornings, during nap time, or after the kids are in bed at night. Make your work portable. Because sometimes life just doesn’t stop, get a laptop or tablet so you can work no matter where you are. You can outline a post during the carpool line, or get your Pinterest work scheduled during soccer practice. Create to-do lists every single day. Perhaps the biggest time waster is deciding what to work on each day. Before you finish work for the evening, jot down 3-5 tasks you must do the following day. That way, when you sit down to work, you can get started right away. Use an editorial calendar. To keep blogging regularly, having an editorial calendar is essential. This lets you see what posts are set to go live when, so you don’t get behind. Delegate tasks. Avoid trying to do everything yourself. You can hire a VA to work on your social media promotions, or do one-off projects with someone for graphics or content. Invest in blogging tools. Using software and programs for your blog will reduce the time it takes you to get things done. CoSchedule is an excellent tool for scheduling content and social media shares. Tailwind is great for all of your Pinterest activity. Figure in more time than needed. When planning your day, schedule more time to get tasks completed than necessary. This allows you to get everything done without feeling rushed. Keep your email organized. It’s a pain to go through a busy inbox every day, but deleting as much as you can and moving the rest to folders keeps your inbox organized. Then, when you need to find that ONE email you will know exactly where to look. Do as much as you can the night before. If you tend to blog in the mornings, prepare the night before. Get the kids’ lunches made and clothing for yourself and the kids laid out. This will help make your morning run more smoothly and gives you more time to work. Work in sprints. Ever heard of the Pomodoro technique? It involves focusing only on work for 25 minutes, then taking a 5-minute break. Set a timer so you know when to start and stop. This sprinting will allow you to accomplish a great deal in a short time. Turn your chores into educational time. Mom bloggers should never stop learning how to bring traffic to their blog and make more money. Use time doing laundry or the dishes to listen to podcasts that will be helpful to your business. Time management for mom bloggers is all about finding little pieces of time where you can work. You may have to get creative to balance it all, but growing your blog with everything you need to do is certainly rewarding! These are some really great tips. I don’t know how mom bloggers do it, when I have my grandkids, I can’t get anything accomplished. I’m sure your tips will help many with their time management. I think I need to try a mom helper a couple of times a week for the grands. Blogging is hard work and it takes dedication. Taking care of small kids I’m sure your have to be very organized. Waking up early and doing things in batches really really helps me stay on track! I need to do a better job of limiting distractions. Limiting distractions is huge for me. There is always something to be doing and I have to really learn to focus on the task at hand. Finding balance is very challenging. I need more than 8 hours sleep. My morning is always crazy, take care my kids then go to grocery, etc. Waking up at the same time and investing in blogging tools are my favorite out of this list. They are definitely super important for your energy and time. I find it very helpful to wake up early when the kids are still on the bed. Thanks for all your helpful tips. It is so hard to balance work and Motherhood. These are great tips for bloggers who are trying to have a work and parenthood balance. Time management can be a challenge for me. I will have to try doing my work in sprints. These are some great ideas, I am not a Mum but I think a lot of them I could use myself as my time management is awful! Having a good plan and schedule for blog related activities would really be helpful. Set daily goals and try to fit it in your daily routine. These are excellent tips for mom bloggers and work-at-home moms. I do try to get up early to get things done. Yup I get easily distracted when I sit down and plan to work on a post. I look at my email and next thing I know I am doing exactly what I don’t need to do lol. Thanks for this. I’m in awe of moms who blog! I didn’t start blogging until my kids were grown. I need these blogging tips for when the grandkids are here. I have been doing this for almost years now, so I have my schedule down PAT. I hate when things come up to mess with my routine – it throws my whole day off. i am not a mom but i can def se most of these. i know the Complete work in batches and creating and editorial calendar is something i will incorporate now. This is something I really want to work on this year. I always say I really can’t work any harder, but I CAN work smarter! This is exactly what i need this year! My resolution is to become better with time management! These are really awesome tips! Time management is really a challenge when you work from home. Gotta have to try these tips! These are really great tips! I am still trying to get a handle on my time management techniques and stick to those to-do lists so that I stay on track. Definitely going to bookmark this post! These are all such great tips. I make a to-do list every day to make sure I don’t forget about anything. It is so very easy to do. I’m definitely a fan of scheduling everything. This year I should try doing daily to-do lists as well. It seems so difficult to manage my time. It seems as though the list of things I need to do continues to grow instead of shrinking. I really need to learn to manage my time better. I will have to try a few of these time management tips. I like to set an alarm in the evenings to remind myself to shut off all my devices. I think these are all such great tips. It sure can be hard while being at home blogging. It does take up a lot of time, so I try to do things in batches too. I love these tips and practice many of them. I find keeping up with things like email helps to keep me at my best and on my game. I tend to get more things done in prep at night than I do early in the morning. These are great tips though even for us fur baby mamas! These tips are fantastic. Time management has forever been my weakness. These are such great tips. I am going to try batching this week! It can be SO hard to balance blogging and being a mom! There is a lot of great tips here that I will be implementing! There are EXCELLENT tips, I am bookmarking this. I do most of these but some are awesome and I’m going to do, like the pod casts. Do you have any reccos? Blogging is definitely hard when you have to take care of the family. These are great tips to aid the work life balance. These are great! It’s so hard to balance blogging and family. I’ve been doing it for years, and I still don’t have it down. Thanks for sharing this!